Brass is an alloy of copper and zinc. It is strong and durable. 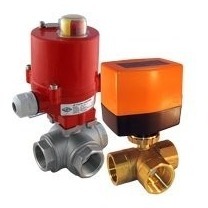 Brass electric ball valves are used for example with (slightly dirty) water, (compressed) air, oils and fuels. Brass is not suitable for chloride solutions (such as sea water, demineralised water, swimming pools). 3-Way ball valves can have a T-bore or L-bore and can distribute or mix flows by rotating 0-90 degrees. During rotation, the ports overlap.